Find this book at Amazon.com | buch7.de | eurobuch.com | buchhandel.de | books.google.com ASIN=0674005384, Category: Science, Language: E, cover: PB, pages: 166, year: 2001. François Jacob, Nobel laureate, scientist, historian, and one of the pioneers in genetic research presents the dangers and potentials of natural science in microbiology. His book is illustrated by historical culture. For example, a fly is generally considered boring and useless. But because it proliferates so fast, 30 years ago it made a career in laboratories worldwide as an object to experiment with life itself. Drosophila gave birth to fundamental knowledge of modern genetics: The difference between the various living beings is not in the genes but in different combination of the same basic building blocks. We know that in the meantime, thanks to e.g. : Matt Ridley's Genome, but what makes "Flies, Mice, and Men" outstanding is that you'll find intersting parables about scorpions, frogs and snakes, Zeus and women, odipus, the paradoxical clairvoyant Teiresias, tabus, transgression, and conflicts in marriage. This book is one of the rare hardtoputdowners. 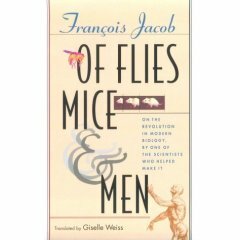 Read more about "Flies, Mice, and Men" in the IBS review of the book's German translation.